Films are made all over the world but the most widely seen are those intended either for commercial release in mainstream cinemas or on the international film festival circuit. This means that they follow certain widely understood conventions. But what of films produced in countries with few, if any, cinemas? Or films made from within communities with only limited connections to the mainstream cultures of West or East? Are we forced to ‘read’ them through the critical faculties we apply to Western films? Do we worry about finding them ‘exotic’? Do we underestimate the vision and imagination of local filmmakers? 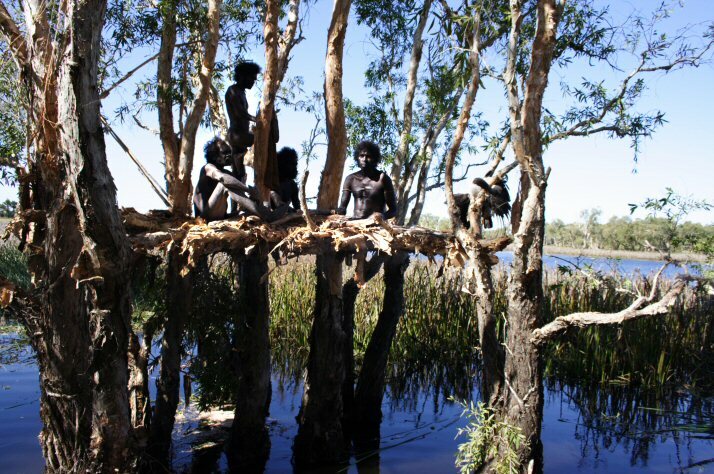 The Day School will explore several different filmmaking approaches from Africa, Asia and Indigenous Australian Cinema (such as Ten Canoes, Australia 2006 – see the image above) that attempt to allow local peoples and local cultures to present themselves as they might wish to be seen. We’ll also consider the barriers faced by these productions. (Please note there will not be a full screening as part of this event. We will, however, discuss aspects of Timbuktu (France/Mauritania 2014) screened on Wednesday 18 (Kala Sangam) and Thursday 19 November (Dean Clough) and we will introduce Theeb – to be screened on Wednesday December 2nd at Kala Sangam and December 10th at Dean Clough).